From a sporting point of view, Colombia had a very easy stage in the Giro d'Italia but from an emotional point of view it was a hard stage. The team wore a white cockade as a sign of mourning for a tragedy that happened in their nativew Colombia. After the second rest day, Giro d’Italia set off again with stage 10, 173 flat kilometres from Modena to Salsomaggiore Terme. Frenchman Nacer Bouhanni (FDJ) took his third stage win in the foreseable sprint finish, once again preceding Giacomo Nizzolo (Trek) and Michael Matthews (Orica-GreenEDGE), while Cadel Evans (BMC) easily got through another day in Maglia Rosa. Fabio Duarte, 44th, was the best Team Colombia rider to the finish line of a quite seamless stage, characterized by a long two-man breakaway – Bandiera (Androni) and Fedi (Neri Sottoli) – confidently kept under control by the bunch and finally reeled in 15 km ahead of the inevitable sprint. 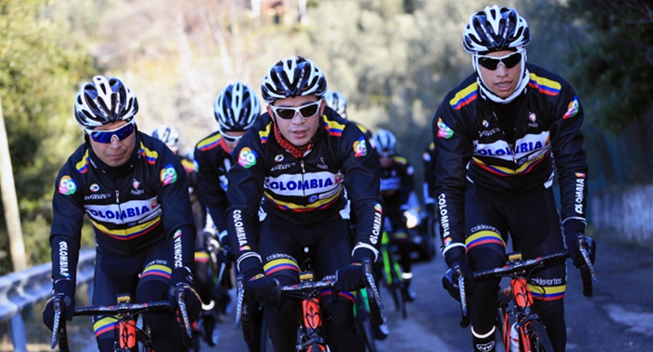 A moment of strong emotion took place at the signature stage in Modena, where Team Colombia reached first with all riders wearing a white cockade on their chest, as a sign of mourning for the tragedy happened on Sunday in Fundacion (Colombia), where 32 children lost their lives in a bus arson. Tomorrow the Giro d’Italia peloton will face one of the longest stages of the race, 249 km from Collecchio to Savona: with the Cento Croci pass located in the first half of the stage, and Naso di Gatto climb in the finale, the day could easily prove a good one for breakaways.